How to transfer Videos from computer to Windows phone with Zune? 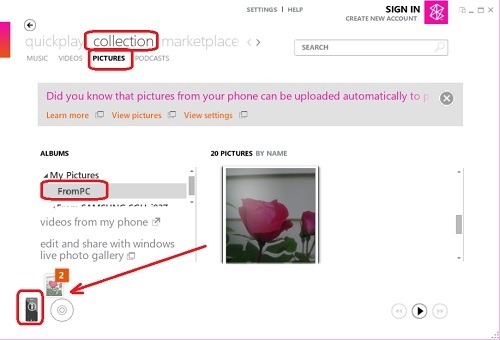 If you have some nice Videos on your computer and you want to transfer them to your Windows phone, you can do this using Zune software. 1. Create a new folder C:\Users\"name"\Pictures\Videos\FromPC. 2. Go to archive.com Web site and click Video > Animation & Cartoons > Film Chest Vintage Cartoons > Mighty Mouse: Wolf! Wolf! 3. Click on "25.8 MB" at the end of "mighty_mouse_wolf_wolf.mpeg" line under "Movie Files" to download it in MPEG4 format. 4. Save the "mighty_mouse_wolf_wolf_512kb.mp4" to C:\Users\"name"\Pictures\Videos\FromPC. 5. Download more free movies. 6. Connect your Windows phone and run Zune software. 9. Wait for the synchronization to finish and disconnect the phone. 10. On your Windows phone, tap Music + Videos > Videos You see "Mighty Mouse: Wolf! Wolf!" showing up in the list. 11. Tap on it to play.